Ram today offered the first public glimpse of the new 2019 Ram 2500 and 3500 Heavy Duty Lone Star at the DFW Auto Show in Dallas, Texas. The Ram Lone Star is distributed only in Texas and distinguished by unique "Lone Star" tailgate and interior badges. Ram was the first automaker to introduce the model available exclusively to the largest pickup truck market in the U.S.
"First and foremost, the Ram Heavy Duty Lone Star edition is a powerful, hard-working truck that meets the demands of Texas truck buyers," said Reid Bigland, Head of Ram Brand. "Trucks are a big part of life in the Lone Star State, and Ram offers the segment's best combination of performance, strength, luxury and technology." New 2019 Ram Heavy Duty outpowers, out-tows and outhauls every other pickup with 1,000 lb.-ft. of torque. Ram also achieves the highest capability numbers for diesel- and gas-powered pickups: 35,100 lbs. towing and 7,680 lbs. payload. 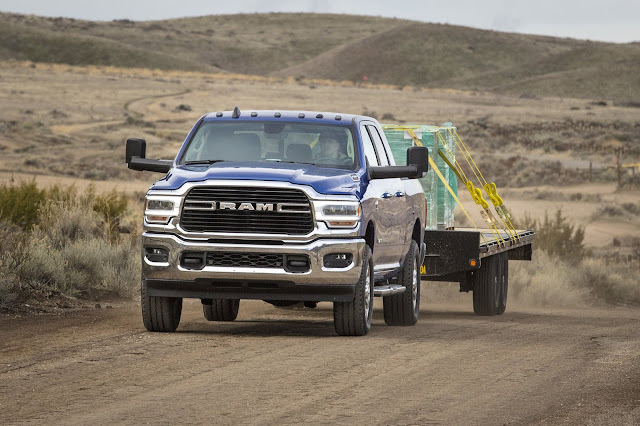 Ram redesigned its Heavy Duty line for 2019 to be the best riding, handling and towing ever with an emphasis on comfort and confidence. Active noise cancellation, anti-vibration devices and acoustic glass all contribute to the quietest cabin yet. Ram dramatically improved its Heavy Duty ride quality with new suspension tuning that includes Frequency Response Damping (FRD) shocks, progressive springs and re-engineered bushings. An exclusive rear air suspension now features driver-activated Bed-Lowering Mode, Normal/Payload Mode and Trailer-Tow Mode. A new 98.5-percent high-strength steel frame offers greater capacities, reduced weight and the highest levels of torsional rigidity. Lightweight materials in the frame, powertrain and an aluminum hood also reduce overall weight by up to 143 lbs. Ram Heavy Duty models offer technologies that help owners tow with confidence. A new 360-degree surround-view camera with trailer reverse guidance view provides a single display-screen view of both sides of a trailer to assist drivers in maneuvering towing setups. A new auxiliary exterior camera improves visibility with custom positioning in and behind trailers. Advanced trailer Tire Pressure Monitoring Systems (TPMS) accommodate up to six pickup tires and 12 trailer tires with up to four trailer profiles. For 2019, the Ram Heavy Duty lineup features a completely redesigned interior with unexpected luxury throughout. Borrowing from the award-winning Ram 1500, the Ram Heavy Duty interior offers more refinement, comfort, convenience and storage than any other truck in the segment. Ram Lone Star is offered with a choice of two interiors packages and four colors. An optional equipment group features a closed upper-dash door with a Lone Star nameplate badge, a power driver seat and Uconnect 8.4-inch multifunction touchscreen. The trim is available with Black/Diesel Grey, Black/Light Brown, Light Frost/Black or all-Black premium cloth seats accented with new interior finishes. Seating is available in two-passenger bucket, three-passenger bench, five-passenger bucket or six-passenger bench seating options. The 2019 Ram Heavy Duty Lone Star is available with a choice of 4x2 and 4x4 powertrains, Regular, Crew and Mega Cab body configurations and 6 ft.-4 in. (Crew and Mega) and 8 ft. (Regular and Crew) bed lengths. The 410-hp, 429 lb.-ft. of torque 6.4-liter HEMI® V-8 engine with class-exclusive 8-speed automatic transmission is standard. The segment's most powerful engine – the 1,000 lb.-ft. of torque 6.7-liter High Output Cummins Turbo Diesel – is available on Ram 3500 models. An 850 lb.-ft. Cummins is also available on both the 2500 and 3500 Heavy Duty. Several other option packages are available with the Lone Star in order to give buyers their choice of function-specific enhancements. They include a Bed Utility Group, a 4x4 Off-road Group, a Protection Group, Max Towing Package and Premium Lighting Group. New 2019 Ram 2500 and 3500 Heavy Duty Lone Star editions will go on sale in the second quarter of 2019. In 2002, Ram Truck was the first manufacturer to recognize the strength of the pickup truck market in Texas and to offer an exclusive edition for the state. The Ram Lone Star edition was the first truck designed by Texans and built specifically for Texans. Since the Lone Star's debut, Ram has sold more than 270,000 of the Texas-only models. The new 2019 Ram 2500 and 3500 Heavy Duty was designed from the outset to deliver the segment's highest levels of capability, without compromising comfort. With 35 all-new and 21 class-exclusive features, Ram combines benchmark performance with strength, luxury and technology. Ram Heavy Duty trucks offer better ride quality than competitors' trucks, made possible by a five-link coil suspension or optional air suspension on Ram 2500 and a supplemental air bag suspension option on Ram 3500.